• How do I find out my level? For a general indication of the levels we use and to see where you might fit into your new language, please see our Levels page. Your teacher will give you a more detailed assessment when you begin your course. The number of lessons you will need will depend on both your starting level and your aims for the course. We are more than happy to provide advice about this. As an example, we would recommend that Complete Beginners undertake 24 hours of classes (12 two-hour sessions) to reach an Elementary level. • Is there a standard length for your courses? No. We offer several standard options, depending on your learning aims and availability, but these are just suggestions. When booking your course, we will tailor your course length to best suit you. Please contact us for further information. • How many people can attend a group course? A group can consist of anywhere between 2 and 12 students. In rare cases, we can accommodate up to 16 students in a class, but we find that with large classes, teachers are unable to provide enough individual attention to help each student progress quickly and confidently. Because of this, we do not recommend this option to our clients. • Can I have a trial lesson to see if I like the course? No. We do not arrange «trial» lessons, as it is both difficult to judge a course by its initial class (as they are introductory and focussed on assessment of a student’s proficiency and needs) and our teachers do a lot of preparation for each course they teach. Most qualified, experienced teachers would not agree to teach one lesson on its own. We are happy to provide teacher profiles if you would like to know more about an individual teacher. • What qualifications do your teachers have? Our teachers are all native speakers who are both experienced and certified to teach their own language to foreign learners. Many of them also hold university degrees majoring in education or their own language. • Can I see my teacher’s references? Listen & Learn confirms the references of all of our teachers, but we can also provide teacher profiles to students by request. On occasion, Listen & Learn may request that a student provide a reference from a friend or colleague to attest to their good character. This is usually only in the case of one-to-one classes being held in the student’s home or the teacher’s office, and is for the comfort of both parties. • What happens if I need to postpone a lesson? We can postpone any class until a more convenient time for you. As long as you give your teacher or our office two working days’ notice, this service is provided free of charge. • If students are absent from a group course, do you provide make-up classes? It is possible to arrange extra classes, but they will be deducted from the total number of classes you have paid for. If the teacher is notified in advance, it is possible to record the class so the absentee may listen to it later. Another option is to arrange live online classes, which can be attended even when students are in remote locations (as long as they have an internet connection). Online classes can also be recorded and reviewed later. • What if I need to take a break during the course? If you need to put your course on hold, please notify either your teacher or our office. We only need to have two working days’ notice, but it would be helpful if you could advise us in advance, so that your teacher can plan your lessons while taking your break into consideration. • Will I receive a certificate when I complete the course? Yes. At the end of your course, you will receive a course attendance and completion certificate, which confirms the language studied, the number of hours completed and the language level attained. • If I need to relocate during my course, can I continue my lessons in the new location? It is usually not a problem to find a replacement teacher in a new location if you are moving to a major city. There may be a delay if your new location is not in a major centre, so it would be helpful if we were informed about the relocation as soon as possible. This will help to ensure that your course continues running smoothly and without interruption. There is normally a relocation fee of £200.00 to cover administration costs. • Do you ensure that I have the same teacher for the entire course? Unless you have specifically asked for more than one teacher, we will do everything within reason to keep you with the same teacher for the length of your course. Our teachers are only human, however, and we cannot foresee illness or personal circumstances. In these rare cases, we may need to replace your teacher at some point during your course, but we will notify you as soon as possible and do our utmost to find a suitable replacement. • What happens if I need to cancel my course? If for any reason you need to withdraw from your course completely, please let us know as soon as possible. If you have completed, or are within two working days of, your first session, you will be issued with a credit note for the balance of your invoice, less the cost of any classes already taken (including late cancellations), the cost of any course books supplied, and a cancellation fee of £399.00 or €450.00. • What if I have problems with my teacher? Please feel free to contact us if you have any feedback or suggestions about your teacher or course. We will liaise with your teacher to help improve your learning experience as much as possible. If you find that your teacher remains an unsuitable match in terms of personality or teaching style, we will do our best to arrange a suitable replacement at no additional charge. • Is VAT included in your prices? No. For all language courses in the UK (except for English), please add 20% VAT to our quoted prices. All of our courses in Ireland are VAT-free, so the final price will be as quoted. English courses are VAT-free in both the UK and Ireland. • Do I have to pay for the lessons in advance? Yes, our courses are paid for in advance. Initially, we require a deposit of £350.00 (+VAT) (Sterling cheque or major credit card) or €450.00 (bank transfer or major credit card). After the deposit has been received, you will be able to commence your lessons. We will then invoice you for the remainder of the course fees. If you would prefer to arrange payment by instalments, please contact us for further information. • Why do group lessons cost more than one-to-one lessons? The higher price for group lessons covers the cost of extra materials, as well as added administration costs. Teachers also need to incorporate the aims of each participant into their course planning. • If students are absent from a group class, will you still charge for them? Yes. Our group prices remain the same no matter how many students attend the class. Our teachers anticipate the full number of students and prepare their lessons to suit. Absentees are generally expected to catch up on missed material before the next lesson to avoid interrupting the progress of the rest of the group. • Is it possible to pay per class and for the number of students in the room? Do you have a “pay-as-you-go” service? Unfortunately, none of these options are possible. Our teachers invest a lot of preparation in their courses and need to know how long the course will last and how many students are likely to be in the class each time. It is also important to note that we aim to move students along as quickly as possible and if a student regularly misses a class, it will be very difficult for him/her to keep up without holding the majority of the class back. Rare absences are not a problem if the student is willing to catch up on material missed. "The German lessons are going well and I feel they are an excellent refresher for me. 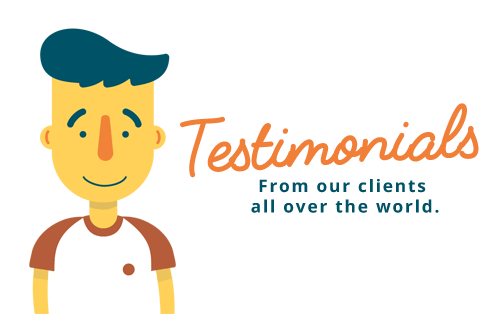 My teacher has been really helpful in sharing specific business-related vocabulary and situations."